The Back Straightening Massager is a lumbar extender that is used to loosen up tight muscles and relieve back pain caused by excessive flexion, pain due to overworking, and poor spinal alignment and posture. 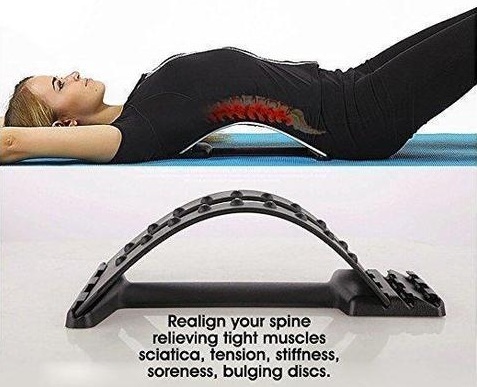 It is designed to make stretching your back easy, safe, affordable, and enjoyable. It is used to help relieve chronic back pain, correct postural imbalance, restore the natural curvature of the back and improve flexibility in shoulder and back muscles. Highly recommended and used by Physicians, Chiropractors, and Professional Athletes! Love it! But you must be VERY careful. I tried using it on a setting too high and pinched a nerve. Luckily, I was more careful the next times. It gives a nice stretch. I LOVE THIS THING! Let me say that for the past year every time I wake up my back was killing me. After the first few times of using this I haven't had an issue since. The first time I used it, I could feel my back popping and stretching. LOVE IT! I have used this product for over a month. I have a tight lower lumbar and this product really does help stretch the area. You must be patient with this product and let it sink in to the area that you are trying to stretch. A good 5 minutes is about perfect to find some relief. I keep it real simple and start with my feet on the ground with my knees in the air (arms at my side). I eventually work towards straight legs and arms stretched above my head by the end of the five minutes. This is a pretty good tool. I can not say enough about this back stretcher. I have had chronic back pain for over 10 years and has been getting worse with time. My upper back and neck pain was so unbearable that it’s led me to try anything available. I’ve gone through 4 mattresses in 5 years, numerous pillows, Chiropractic treatment, weekly massage therapy, you name it. Nothing has come even close to the relief that I got from laying on this. I’ve been using it for 1 week today, 2-3 times a day on the second level. It’s like magic. With improper use, or certain medical conditions, this product could make your back pain worse. It's very helpful in stretching the back, and comes with good information on how to properly use the stretcher. I would recommend setting the stretcher to level 1 and just letting it sit and bend into shape before use when you first get it. My shoulder/upper back/neck muscles get really tight. When my husband massages them he always says they are like guitar strings. Five minutes a day on this back stretcher alleviates my tight muscles. I have no idea how this works as it stretches your lower back, not your upper back. It's a mystery we may never understand this side of heaven. It could be invisible gnome masseuses, maybe mystical chinese dragons have touched it. Honestly I thought this was a gimmick of some kind or just another nonsense item I would buy, use once, be disappointed and never touch it again. TOTALLY NOT THE CASE. I've used it for several days now and oh my goodness it feels amazing. Especially if you use it in conjunction with a spinal / cervical pillow type thing. Honestly feels amazing. I work as a first responder so I'm no stranger to back problems. This actually does help. STRETCHES YOUR SPINE GENTLY TO YOUR COMFORT LEVEL. I HAVE NOT BEEN BACK TO CHIROPRACTOR IN A MONTH. I UTILIZE EVERY DAY WHEN SITTING PLAYING VIDEO GAMES. KEEPS SPINE STRETCHED & LIMBER. FELL LIKE A YOUNG KID AGAIN:). I sit at a computer all day and then sleep in the fetal position. Needless to say I was in serious need of a low back stretch. This thing works great! Start on the lowest position and stay there for a couple days. It really has made a difference with my posture and low back aching all the time. This thing works awesome. I am fixing my issue by not sitting so damn much at work, but when I would sit for too long, laying on this would help immensely, and only took about 5 - 10 minutes and I could walk again. I have been having a hard time going to the second "level" but after my back issues subside, maybe I will be able to.